Successfully Added Waterproof MP3 Player - IPX8 Rating, 8GB Memeory, About 2000 Tracks, 8 Hrs Battery Life, FM Radio to your Shopping Cart. 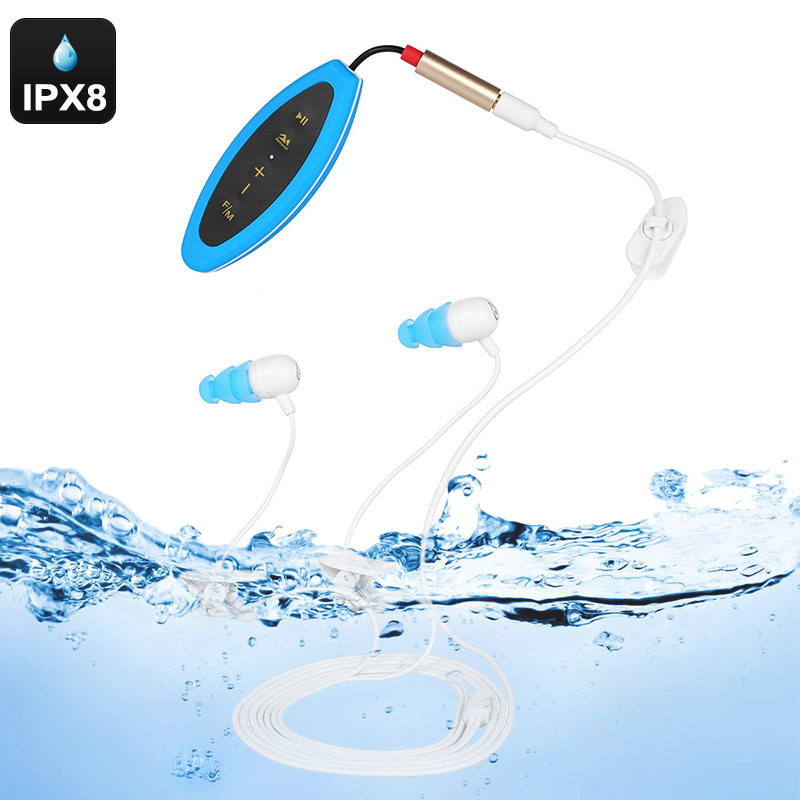 This Waterproof MP3 Player with IPX8 rating is ideal for swimming and bathing. 8GB of build in memory let you store around 2000 tracks on this MP3 Player. Built in battery offers up to 8 hours of audio play time. Strong clip and easy navigation buttons keep the controls at your fingertips. With its external 3.5mm headphone jack that also doubles as a charging port these waterproof earphones are your ideal companion for the beach or pool. Its sealed and waterproof design give rise to the IPX8 rating and it is waterproof to 3 meters so whether your swimming in the pool, taking a dip in the ocean or relaxing at the spar this waterproof MP3 player and headphones will let you enjoy soothing or inspirational tunes as you desire. The strong spring loaded clip makes it easy to securely attach to your bathing costume and simple controls ensures you can navigate you audio library without any difficulties. With 8GB of internal storage you can fit about 2000 songs on this MP3 player. But should you want you can also listen to the radio as FM 87MHz to 108MHz is supported. This waterproof MP3 player has a built in battery which can be fully charged in just a couple of hours, this will then let you enjoy music for around 8 hours. So even if you're a dedicated swimmer who swims for hours a day this MP3 player will be with you every stroke of the way. There is support for MP3, WMA, WAV, FLAC, APE, and OGG file formats lettign you play songs from a range of sources. This waterproof MP3 player comes with 12 months warranty, brought to you by the leader in electronic devices as well as wholesale audio gadgets..